Unless you’re a tech prodigy, building a gaming PC from scratch isn’t something you can dive into on a whim by just hammering a motherboard to a graphics card and CPU, then sticking it next to a desk fan. No, before you start putting your maiden machine together, you need to clock hours of research into which parts work best with which other parts, and what’s most important in ensuring your PC strikes that precious balance between economical and futureproof. We’re going to help you lay the groundwork for building a new PC - from the latest hardware technologies (and traps), to the best websites for finding components. This guide will cover the journey right up to the moment you pick up the screwdriver and get to work. First of all, you should establish what kind of gaming you want to do, which will give you some idea of a budget. Have you not played in years and just want a PC capable of playing all the great indie games (and maybe some more mainstream titles at medium settings)? Do you want a PC that will run most games without a cinch for a good couple of years? Or are you going all-in on a powerhouse build? If you have no idea where to start, you should put together a list of the modern games you’re most interested in playing, and look online to see how they perform on various PC and GPUs. The best place to check this is the FPS section of UserBenchmark, where you can browse a list of over 300 of the most popular games, select one, then see detailed information on what kind of frame-rates it attains on different GPUs. Are you a fiend for framerates of 100fps and more, or is the 30-60fps region you’d get on a console quite enough for you? This will greatly affect how much you need to spend. Beyond the games list, UserBenchmark is one of the best sites to compare just about all components you need in your PC, as it benchmarks the performance of millions of its users to show you how each component performs on average. It provides prices too, and lets you build a sample PC to get some idea of how it will run and how much it will cost. 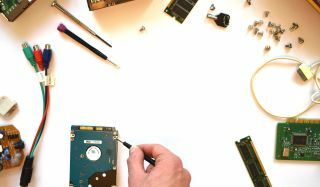 Once you have an idea of the components you want, you should go to PC Part Picker to get a price comparison drawn from a vast pool of websites. Here you can also set price alerts, so you get a notification when a part hits your biting point. Other sites for finding great deals are the community-led HotUKDeals in the UK and Slickdeals in the US, where regular consumers post deals whose value gets voted on by other users. A lot of these posters really knows the ins and outs of the internet, so expect to find prices here that you might not find anywhere else. Similarly, the r/buildapcsales and r/buildapcsalesuk subreddits tend to be brimming with great-value components and helpful discussions. So, what kind of components will you need to build your first gaming PC? Read on for a full breakdown. The battle here is between Nvidia and AMD, with the latter relying on cheeky price undercutting to get itself noticed. A good general rule is not to buy a GPU that’s more than two generations behind the current one. Even if on paper the core clocks and VRAM look similar (or better) on an older card, they’ll be well behind the curve in terms of GPU architecture, with inferior cooling, noise levels and compatible techs. For example, the core clocks of the GeForce RTX 2000 series may be lower than the core clocks of equivalent RTX 1000 series cards, but they’re still considerably faster due to myriad other factors like an increased number of CUDA cores. The RTX 2000 series is also capable of spectacular visual effects like ray tracing and DLSS (Deep Learning Super Sampling), which uses AI learning to deliver the smoothest edges ever seen in gaming. The point here isn’t that you have to get an RTX 2000 series GPU (though they are very good), but rather that graphics tech progresses faster than other components, and you don’t want to start off too far behind on this front. You’re looking at two main manufacturers here: Intel and AMD. As with GPUs, you’re likely to get more bang for your buck with AMD, whose gaming-level Ryzen CPUs and top-end Threadrippers tear up the script by offering performance not far off Intel’s i9 series for a fraction of the price (though the top-end Intel processors do still win out if you’re willing to spend as much as $2,000 on just the CPU). In the mid-range, it’s a similar story, with AMD’s game-focused Ryzen 5 2600 and 7 2700 chipsets significantly undercutting the mid-range Intel i7 and i5 series’ prices for relatively small sacrifices in performance. The Ryzens offer incredible value for six- and eight-core chips, with the Ryzen 5 2600 and Ryzen 2700 coming it at just under and over £200/$200 respectively (yes, you get a much better deal Stateside). The crucial thing to remember here is that not all CPUs fit all motherboards. You can’t use an AMD CPU in a motherboard designed for Intel CPUs, and vice versa. On top of that, different CPU generations have slightly different pin layouts, and you’ll need a motherboard designed for that layout. Base your motherboard on the CPU you want, and not vice versa, as your CPU has a more tangible impact on performance. It goes without saying that any big, graphically-demanding game released in the last five years should be played on an SSD (though a high-capacity 7200rpm HDD will suffice for indie games, older games, videos and documents). Likewise, Windows 10 will run much better on an SSD. The bigger question in 2019 is, what type of SSD should you buy? You may have heard about SSHD - traditional hard drives with a small SSD component - but these are hard to recommend, offering minimal performance gains over regular HDDs. If you want to combine the capacity of a hard drive with the performance of an SSD, get two separate drives. Then there’s the question of 2.5-inch SATA SSDs, which connect via SATA cables to your motherboard, and the newer, smaller M.2 format, which slots directly into the motherboard. Technically, M.2 SSDs are capable of faster read/write speeds, but you’ll only see these if your motherboard M.2 slots use the NVMe protocol. The base-level M.2 protocol is SATA, which will deliver similar performance to the SATA-based 2.5” SSDs. NVMe is still quite a way more expensive than SATA-based SSDs however, and if you’re on a budget then you can still get excellent load times out of a regular SSD (you can always add NVMe later on). If you do decide to buy an M.2 SSD, be very careful to distinguish between SATA and NVMe. These two types of drive look almost identical, so be sure you’re getting the one you actually want. Check out our pick of the best hard drives of 2019 to help you choose. There are a few factors to consider with RAM. DDR4 RAM is the uncontested RAM format today, and a given at the time of writing (DDR5 is expected at some point in 2019, but there’s a lack of concrete information at this point, and it’ll take a while to supersede DDR4 anyway). The most important factor with RAM is how much you actually have. For mid-range gaming, you’ll want at least 8GB. Many of the most recent games are known to hog 10-12GB RAM during play, so if you want to be really comfortable you should go for 16GB. RAM speed (or frequency/MHz) is a contentious issue, offering more visible effects in some games over others. You’ll certainly gain a few fps by upgrading from DDR3 to DDR4 RAM, but once you’re within DDR4, the speed gains once your RAM goes over 3000 MHz shrink considerably. 2400 MHz - 3000 MHz is generally seen as as golden zone when it comes to performance and value. And let’s not forget that it’s all the rage for RAM these days to feature RGB lighting, funking up the inside of your PC like a 70s disco (strictly optional). A lot of a motherboard’s quality comes down to indiscernible things like the quality of its capacitors and VRMs, which are vital to managing heat and keeping things stable in your PC. The more obvious gain you get for spending more money on a motherboard is more compatibility. In 2019, you’ll definitely want your motherboard to support fairly modern formats like M.2, NVMe, DDR4 RAM and USB 3.0 (and most motherboards should). Some motherboards are designed towards overclocking, others have built-in WiFi and Bluetooth. Splash out more money, and you can audio-centric motherboards that do a much better job of isolating the sound components (leading to less noise interference), or even water-cooling elements to help facilitate CPU and RAM overclocking. But a lot of these things are bonuses, rather than essentials. So long as it supports those formats we mentioned earlier, a decent-brand motherboard will be just as capable as an expensive one of handling your hardware in its default non-overclocked state. With that in mind, you’re probably better off funnelling your gaming PC finances into your GPU or CPU instead. No you have the basics, head over to our step-by-step guide to building a PC to find out how to put it all together.